ReviseSociology – Page 98 – A level sociology revision – education, families, research methods, crime and deviance and more! One of the out of school factors which could explain why girls do better than boys in education is that girls have higher aspirations than boys. Here’s some recent research which supports this while also suggesting that the relationship between gender and aspiration is also strongly influenced by social class background. The data below’s taken from The British Household Panel Survey and is based on a sample of nearly 5000 10-15 year olds. This research found (among other things!) 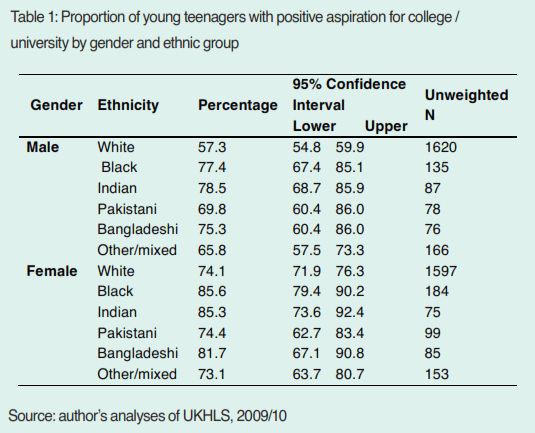 that that boys are less likely than girls to aspire to go to college / university across all ethnic groups. The numbers are especially divergent for the white ethnic group – 57% (boys) and 74% (girls). However, when you break things down by social class background (NB this is analysis!) things look more differentiated – Basically, boys from professional class backgrounds aspire to university, but those from all other social class backgrounds generally do not, while girls from all social class backgrounds seem to aspire to go to university. To put it bluntly (OK crudely) what these statistical comparisons suggest is that working class boys don’t generally aspire to go to university, whereas working class girls do. Nice easy comparisons – As evidenced in the perty charts. Of course the above statistics (this is a classic limitation of quantitative data) tell you nothing about why working class boys but not working class girls do not aspire to go to university. It could be due to parental attitudes filtering down differently to girls than boys, or it may be other factors which have nothing to do with socialisation. These stats don’t actually tell us! Extension Question – This information was relatively easy to find, it’s quite easy to understand, directly relevant to the AS Sociology syllabus and gives you some easy analysis points – how many of the new (forthcoming) AS text books would you expect to find this information in?